In a goodwill initiative of the BTC authority and upholding one of its pre-poll promise, Meritious girl students of underprivileged BPL class who cleared +2 Exams last year in Bodoland were awarded with a gearless scooter popularly known as Scooty each in a ceremonial function at Udalguri HS School recently. This is the first of its kind programme which got underway from Udalguri. 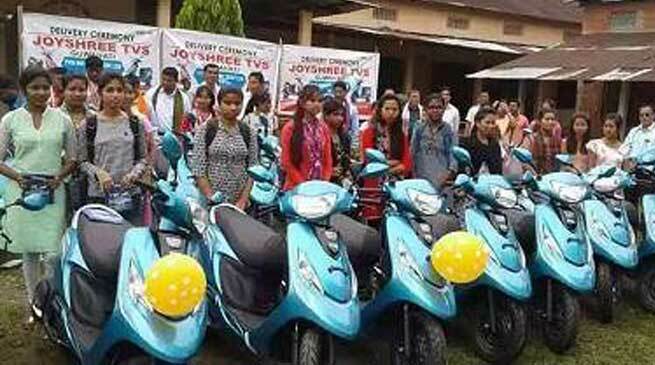 A total of 26 gearless scooters were given away to BPL girl students of the district. The programme was graced by Kampa Borgoyary, Deputy Chief of BTC, RS Borgoyary, director of Education, BTC, Rihon Daimari, hon’ble Cabinet minister of Assam, Tridip Daimary speaker of BTC, Jagadish Sarkar among many others.